Today Saint James calls our attention to two attitudes of the heart fundamental to the Christian life: humility and poverty of spirit. “Receive humbly,” he says, “the implanted word, which is able to save your souls” (Jas 1:21). The Word of God comes to us with power in every celebration of the Sacred Liturgy. Whenever the Word of God is proclaimed — in the psalmody and readings of the Divine Office, in the readings and proper chants of the Mass, in the homily — it is implanted within us. 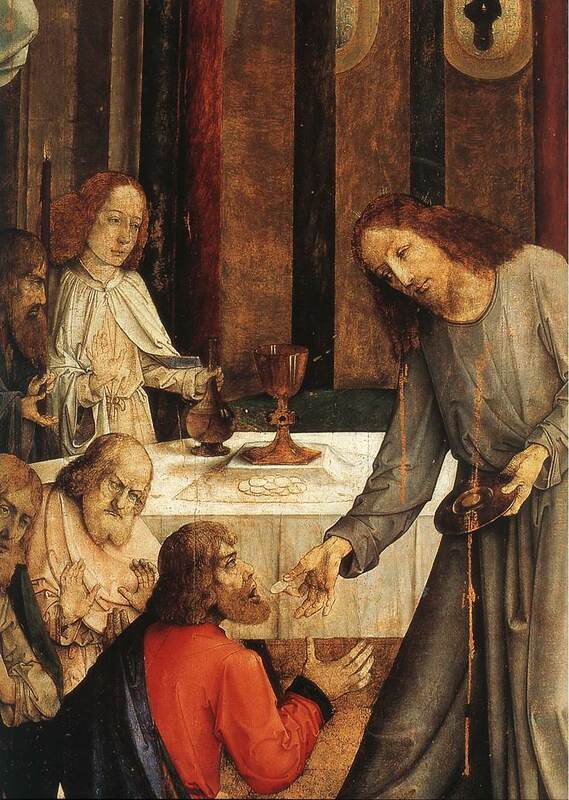 “He who sows the good seed,” says Jesus, “is the Son of Man” (Mt 13:37). Only the humble soul is able to receive the Word of God because the humble soul is capacious and spacious. The humble soul is uncluttered with the elaborate furnishings of self-love and the accumulated debris of sin. Humility and poverty of spirit go hand in hand with silence, or better yet, with what Holy Father Benedict calls taciturnitas or “the habit of preferring not to speak.” Saint Benedict knows that if one is silent one will be humble; and if one is humble, one will be silent. It is this humble silence that is the sign of a poverty acknowledged, accepted, and even loved, because is inner space for the Word. The Virgin Mary received the implanted Word of God perfectly because her Immaculate Heart was poor, uncluttered, spacious, and silent. In the stillness of her heart, Our Lady was able to accommodate the vastness of the Word of God. The liturgy sings: “He whom the whole world could not contain, enclosed himself within your womb.” This is yet another paradox of the Christian life: the more we enter into the way of littleness, the more we are “filled with all the fullness of God” (Eph 3:19). Poverty of spirit is the narrow way that opens up vast horizons within us, rendering us capable of the immensity of God. A heart swollen with self-sufficiency and pride will be a noisy place . . . noisy with thoughts, with interior disputes, haggling, and wrangling. In a heart that is lowly and poor the Word of God creates a space of silence as it resonates and in that silence the Word unfurls, expands and becomes wonderfully fruitful. When, in the twelfth century, the first Cistercian monks set about reforming their lives, they built churches that were marvels of chaste simplicity, filled with light and uncluttered space. Their churches were nothing more than virginal spaces for the resonance of the Word. These churches, many of which are still standing today — I think of Sénanque, Sylvanès, and so many others — image the interior state of the Christian who receives the implanted Word meekly, humbly. There is nothing to muffle the sound of the Word, nothing superfluous, nothing to compete with the Word of God, the “one thing necessary” (Lk 10:42). 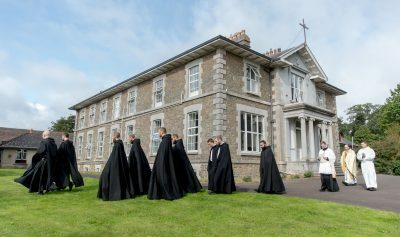 The Cistercian monks of the twelfth century had another practice as well: they constructed their monasteries in lowly valleys. This was determined by a very practical reason: ready access to the streams and rivers which roll between the hills. There is a spiritual significance as well. By choosing to build in the bottom of a valley, they illustrated their desire to dwell in humility and lowliness of heart. There they were certain of encountering the Lord Christ, for He waits for us always in the lowliest place. Our Lord will not set foot on the mountains of our self-love and spiritual pride, but He runs to meet us in the valley of poverty and weakness. “Behold, He comes, leaping upon the mountains, bounding over the hills” (Ct 2:8). The mercy of the Father bypasses those who trust in their own virtue and flows copiously to fill the hearts of poor sinners. The wisdom of the Father bypasses the clever and self sufficient and comes to rest on the childlike and simple. The strength of the Father bypasses those who rely on themselves and searches out those who are content with weakness and familiar with the experience of failure. These are the gifts of the Father of lights — mercy, and wisdom, and strength — that descend from above into the valley of the poor in spirit. The gift of the Law spoken of by Moses in the First Reading from Deuteronomy, must be understood in the same way. God chose Israel. It pleased God to enter into a covenant with this people of wanderers not because they were mighty and powerful among the nations of the earth, but because of their littleness and utter need of Him. The gift of the Torah was a constant reminder of Israel’s dependence upon God alone. The Torah was a sacrament of God’s presence, the pledge of His readiness to succor His people in their weakness, to deliver them from their enemies, to care for them, and to feed them in time of famine. The purpose of the Law was to remind the children of Israel day in and day out, in innumerable little ways, that God chose them in their weakness, mercifully binding Himself to them by a covenant. In the Gospel, Our Lord teaches that the gift of the Law can be misused and its true meaning distorted. If we use the Law as a way of asserting ourselves and condemning others, as a way of climbing out of the valley of lowliness and poverty of spirit by attaining an outward standard of spiritual excellence, then the Law, instead of bringing us closer to the Christ of Extreme Humility, distances us from Him. The very thing designed to bring about our union with God becomes the means of our alienation from Him. Our Lord would have us know that the place of the covenant, the place to which we must return again and again is within ourselves. Jesus speaks of the “deep recesses of the heart” (Mk 7:21). If we would encounter God, we must descend into the lowest part of ourselves, into that secret inner place which is the point of origin of all our thoughts, words and acts. If we invite Christ to exercise His sovereign lordship in the most intimate part of ourselves, if we beg Him to establish the Kingdom of God there, then thoughts, words and acts will flow out from our heart as the expression of Christ living in us. Then, we will be able to say with Saint Paul: “It is no longer I who live, but Christ who lives in me” (Gal 2:20). Christ Jesus will live in us and act through us, only insofar as we open to Him the secret door of the heart. “Open to me, my sister, my love, my dove, my perfect one; for my head is wet with dew, my locks with the drops of the night” (Ct 5:2). Sin has alienated us from the door of our own hearts. There He waits for us nonetheless: “Behold, I stand at the door and knock” (Rev 3:20). The life of Christ in us will be manifested, as Saint James puts it, in “the care of widows and orphans in their affliction, and in keeping ourselves unstained from the world” (Jas 1:27). The Fathers and Mothers of the Desert teach with one voice that a gentle mercy towards others — and the refusal to judge — are the truest signs of the life of Christ within. The path to humility leads downward into a valley that frightens us when we look upon it from the heights of our pride. But as we descend, it becomes less frightening. Then it becomes attractive; mysteriously we are drawn lower and lower. The deeper we descend the more radiant the valley appears. This is because in the valley’s hidden depths, One who is silent and humble awaits us, the very same One who, in a few moments, will offer us from the altar the food of humility: the life-giving and awesome mysteries of the new and everlasting covenant: His Sacred Body and Precious Blood. In the stillness of her heart, Our Lady was able to accommodate the vastness of the Word of God.